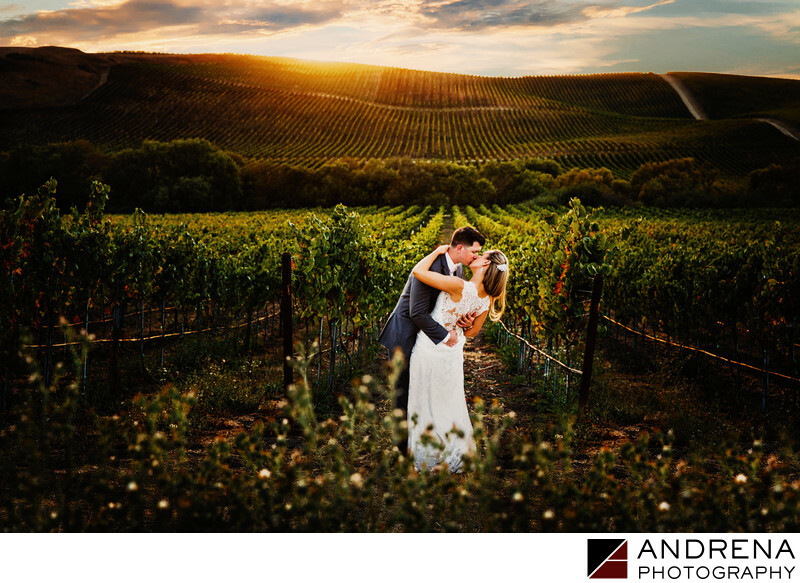 As a wedding photographer who loves shooting in the Napa Valley, I know that the sweeping panoramic images in beautiful vineyards are something that every couple adores. This couple was married at the Silverado Resort and Spa, which is beautiful but which does not have its own vineyards. I thus became obsessed with finding not just the perfect vineyard, but a vineyard that also had vines on rolling hills in the background. I spent nearly five hours trying to find the perfect site, as those vines on rolling hills were very hard to find. Once I found the location, I knew that we would be able to create a series of stunning portraits. As many of this couple's guests had flown in from other cities for this destination wedding, the couple wanted to spend every moment with their cherished friends and loved ones. We thus planned on doing a day-after session so we could create some lovely portraits without pulling the bride or groom away from their friends. This stunning image was taking during our Napa day-after session on a weekend where temperatures soared to 108 degrees.